1959– Newsroom employees at the Providence Journal and Evening Bulletin vote to become members of the American Newspaper Guild, creating Local 41. 1960– After 17 months of negotiations, the Guild wins its first contract in Providence. 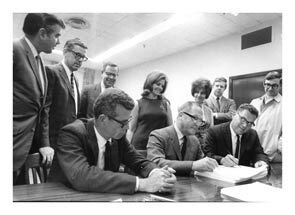 1967– Workers in the Providence Journal and Bulletin advertising and treasurer department vote to join the union, the be followed the next year by the porters. 1973 – Members strike for 13 days over the company’s refusal to allow court action on retroactive pay. The bitter strike does not achieve the Guild’s immediate goal, but it energizes the unit and is followed by a series of generally favorable contracts. 1974 – To take the edge off after the strike, the Guild holds its first Providence Newspaper Guild Follies, a riotous satirical review of the year’s events, at the Venus DeMilo in Swansea, Mass. The skit and song show has become a tradition, drawing 500 in its first year and well over 1,000 today. 1975 – With proceeds from the Follies, the Guild establishes the Harold Brennan Memorial Scholarship fund in memory of a copy editor who held Providence Newspaper Guild card No. 1. The Follies continue to support annual scholarships for Guild members, families and friends. 1979 – The Providence Guild hosts the international Guild convention — but in Boston. Plans to hold it at the Biltmore Hotel in Providence were scrapped to show support for hotel workers who were in an organizing drive at the Biltmore. Those workers prevailed and hold union contracts today. 1983 — The Guild hires Frank Prosnitz as its first full-time administrator. 1990 — Tim Schick becomes administrator of the Providence-based Guild local after three previous administrators served over the previous five years. He will remain for 18 years through grievances, rallies, negotiations and expansion of the local to new areas of Southern New England. 1993 — Newsroom staff at the (Worcester, Mass.) Telegram & Gazette vote to become members of the Providence Guild. 1993-94 — The Guild negotiates more than a year with the Providence Journal over a contract that introduced medical co-pays and a controversial program allowing the hiring of two-year reporting interns. 1994 – The Guild files suit insisting that workers at the Journal’s initial Web operation, Rhode Island Horizons, are members of the bargaining unit and covered by the unit’s contract. 1997 — The Newspaper Guild becomes a sector of the Communications Workers of America, based in part on an early recognition that the convergence of print and electronic media would require a strong voice for the integrity of both. 1998 – The Journal agrees that Internet editors, writers and producers will become Guild members, ending years of litigation. 1999 – Negotiations in Providence take a nasty turn. In the first negotiations after the company was acquired by the Dallas Tex.-based Belo corporation, The Journal insists on a contract that would strip the guild of its role in negotiatoin wages and benefits. 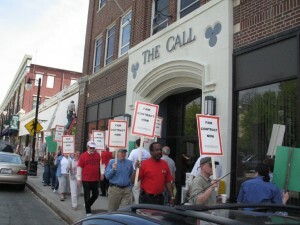 2000 – Providence Guild members overwhelmingly reject a contract that would cripple their union. The company eliminates dues checkoff and stops negotiating grievances, appealing every arbitration decision to court in the hope of depleting Guild resources. Meanwhile, 70 percent of members self-pay dues on time. 2000 – Circulation employees in Worcester vote to join the Guild. 2002 — A judge finds the Journal guilty of 27 violations of the National Labor Relations Act. 2003 — Providence Guild members again reject a “final” contract offer despite massive management lobbying. Months later, the union and company reach tentative agreement on a contract satisfying Guild demands, and members approve it. Years of constructive interaction with the Journal follow. 2004 – After ten years of organizing, employees at the the Worcester Telegram and Gazette get their first contract. 2007 — Guild locals at the Pawtucket Times and Woonsocket Call merge with the Providence Newspaper Guild. 2009 — Tim Schick leaves the Providence Guild administrator position to work for the Guild’s international office in Washington, D.C. The Providence Newspaper Guild hires former Brockton Newspaper Guild President Betsy Regan as administrator.join the Providence Newspaper Guild. 2012 — The Brockton Enterprise local becomes part of the Providence Newspaper Guild.